The Republic of South Africa enjoys a privileged position within the continent. 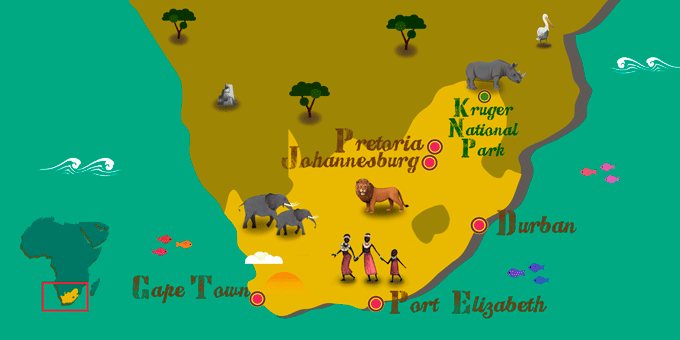 This extensive country of almost 386,000 square miles and has coasts on two oceans, each one with diverse characteristics which complement a thousand wonders of its rocky interior, offering countless possibilities for a vacation package in South Africa. South Africa is economically rather distinct from other nations in Sub-Saharan Africa, also famed for its transition from the Apartheid regime to a modern nation, led by Nelson Mandela. However, economics and politics are trumped by the lure of the safari, top of the wish list for many travelers to South Africa. The country has implemented a successful management program of its wild animals, fostering private investment and accommodation in farms, initiatives since mimicked by other countries. That's why a visit to the Kruger National Park is not to be missed on your travel package to South Africa.